CQL Jobs allows you to run code at specific times of day/week/month on an specific interval. CQL Jobs differs from Script Jobs as it allows you to run your code against a specific set of search CQL results, this will be typically pages. 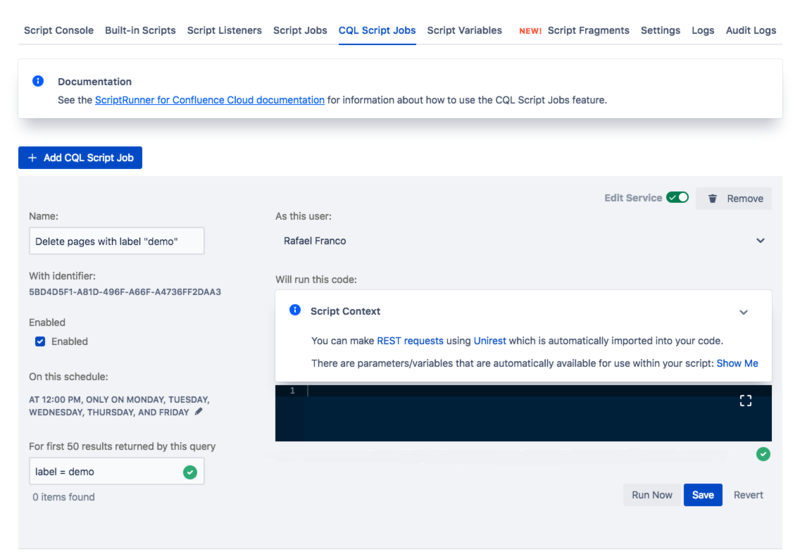 Like Script Jobs, CQL Jobs allows you to automate Confluence, saving a huge amount of time and ensuring your instance is well maintained. To find out more about CQL, take a look at Atlassian’s documentation, here. Each defined job must have a CQL query that will be run in order to find the content that you wish to modify. The code you provide as part of the job configuration will be run against each piece of content individually, and in parallel. Each content will be injected into your code as part of the Script Context. The maximum amount of content you can modify in any execution of an Escalation Service job is 50. In other words, we limit the amount of content returned by each CQL query to 50 items.